I stumbled upon this dish this week and was so intrigued that I had to try it out immediately. 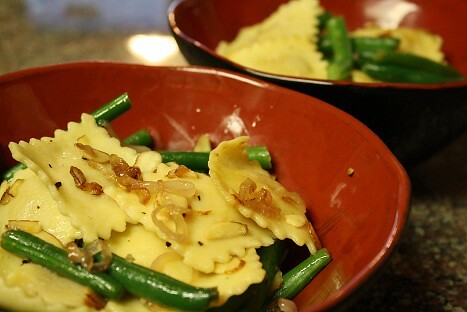 I love my veggies and adore anything involving pasta, so when I found a fresh ravioli and green beans dish, I was beyond intrigued. This dish was so simple that it seemed too good to be true. Also it was pretty healthy aside from the bit of olive oil the dish is tossed with. But I’m here to tell you that after the first bite, I knew I had a new weeknight favorite meal. Here is how it came together. I purchased pre-washed and trimmed green beans that I cooked in boiling water and then shocked them in an ice bath when they were tender. Then with the same pot and water for the beans, I cooked the fresh ravioli and drained it. A note on the ravioli: I love buying fresh ravioli (at my grocery store it’s in the refrigerated section near the eggs and cheese), and it tastes absolutely delicious and is crazy easy and convenient for a quick, weeknight meal. 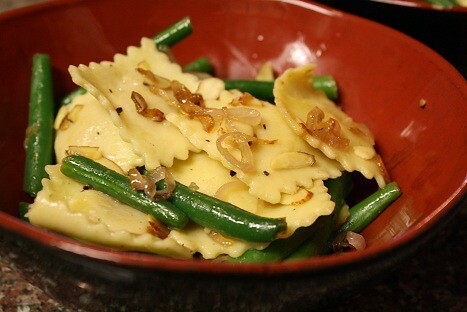 Then in a pan, I sauteed some sliced shallots then added the green beans, ravioli, and toasted almonds. Mix everything together, add some salt, pepper, and the juice from half a lemon, and dish it up. I made a meal out of this dish, but you could use it as a side and serve it alongside some fish or chicken breasts. The ravioli was hearty and surprisingly the green beans fit in perfectly with the pasta. The small amount of lemon juice really pumped up the flavor – gotta love lemon for that purpose. Holy bananas, try this dish ASAP. The leftovers were so delicious and literally every bite I was saying to myself: This is so darned good! Click here for the recipe and step by step instructions…trust me, you’ll want to make this! I heart cauliflower, and these two recipes from this time last year reinforce this position. First off the curried cauliflower dish is so delicious and I think about it a lot – Note to self: I really need to re-make this dish. And as for recipe #2, it’s a mashed cauliflower side dish that involves goat cheese – I mean really, that says it all. If you’re a fan of cauliflower, you’ll have to try these! And if you’re not a fan, then you may just be won over yet! Bon Appetit!